More and more people are beginning to access books via internet downloads, but thankfully a great many women still love the written word in its original format. For some women their love of books has translated into a beautiful collection over the years. Most book-lovers would agree that there are few more enchanting additions to a home than a small library. Books are very personal and we often reflect something of our personality through our book collection. A great many women with a library regardless of its size will testify to inheriting their love of books from a parent or grandparent. For these women, collecting books as an alternative investment may be the perfect companion activity. Ironically, it is the internet that has enabled book dealing to go to a new level. Auction houses and collectors are able to trade more books than ever. New record prices have been reached in several categories. You may be surprised by some of the prices that relatively modern books can fetch. A 15th-century edition of maps by the second-century Greek mathematician Ptolemy sold for $4 million, the highest price ever paid for an atlas. 2006 saw a record price set for an Australian book with the sale of Journey of Discovery to Port Phillip, New South Wales, for $689,000. These prices are impressive, but they are small beans compared to the all-time record for a printed book. That honour went to a copy of John James Audubon's Birds of America. This is a book of illustrations which was sold by Christie's in 2000 for $8.8 million. Manuscripts which are works printed by hand rather than machine, often with unique illustrations, have gone for even more. The most expensive one was Leonardo Da Vinci's Codex Leicester, a notebook filled with drawings and scientific writings which Bill Gates bought for $30.8 million in 1994. One of the most popular myths associated with book collecting is that the presence of an author's signature will add to a book's value. However, as the Irish poet Seamus Heaney recently quipped, he has signed so many books that the unsigned copies are probably more collectable. Heaney's remark is important as it illustrates the different factors affecting a book's price. If there is little interest in it, it is not likely to be worth much, signed or unsigned. On the other hand, if you have a popular genre with an author' signature, then the sky's the limit. 'The complete set of Deluxe 1st Edition hardback, Harry Potter books' signed by the author, J K Rowling, are estimated to be worth between £15,000 to £20,000 each. The collection consists of all seven volumes, including The Philosopher's Stone, The Chamber of Secrets, The Prisoner of Azkaban, The Goblet of Fire, The Order of The Phoenix, The Half-Blood Prince and The Deathly Hallows. Condition is one of the most important things to look out for when you are searching for books for your collection. This is the real caveat emptor of book collecting. Collectors will want the book in the best condition possible. A book with missing pages, for example is almost always worthless. What is by no means worthless, though, is a book's original dust jacket. On the contrary, its presence can multiply a book's value. Rarity is also very important. Many valuable books end up in permanent museum collections, so, rarity is determined not just by the number of copies in existence, but by the number that are still being traded in the marketplace. For example The Countesse of Mountgomeries Urania, written by Lady Mary Wroth and printed in 1621, is the first edition of the first original work of fiction and the second sonnet sequence to be written by an English woman. This is a very rare volume and is expected to fetch around $80,000 at auction. Cultural and historic importance is the third main consideration. Is the book one of the most significant in its field? For example, Christianae religionis institutio (Institutes of the Christian Religion) by theologian John Calvin, sold for $720,000. This book, at the time of being published, had led to wars in Europe and driven Calvinists like the Puritans to the United States. It is seen as one of the most influential books in history. This history obviously adds a huge premium to the sale price. The presumption is that old equals valuable. This presumption is almost always incorrect. What many people don't realise is that there is a category of books that are not very old but can be worth a lot of money. 'Modern first editions' is a term that is generally applied to books published in the 20th century that are rare enough and/or important enough to be collectable. The authors and books are familiar and they are relatively easy to trade on the internet. There is a fairly low threshold for getting started as a collector. It is also possible to buy first editions by some of the most famous and collectable modern authors, for a relatively small amount of money. Also there are still Faulkners and Steinbecks that one can find, in their dust jackets, for a cheap price. The most important thing to remember about collecting modern first editions is "condition, condition, condition." Because many modern books are not inherently rare, what makes a copy collectable is its condition. There were 50,000 copies of 'The Grapes of Wrath' printed and many of them still exist. There are a relatively small number of books that retain their original dust jacket, and an even smaller number in which the jacket has been preserved in fine condition. This can make the difference between a $35 first edition (unjacketed, fair condition) and a $7500 first edition (jacketed, book and jacket both in fine condition). With modern books, from 1920 on, collectable copies will have their dust jackets, preferably in very good condition or better. As a rule of thumb in modern firsts earlier is better. The first edition is almost always more valuable than a second edition. 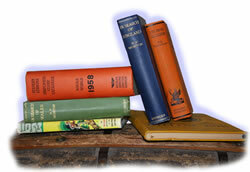 With modern books, there are early copies, review copies, advance reading copies and proofs. All these were actually printed and sent out to reviewers before the first edition, and these help make a book, that might not be especially rare as a regular first edition, more collectable. Changing tastes in literature can also influence a book's value. Early editions of Ernest Hemingway are more popular than works by his contemporary Joseph Conrad, for instance. Simply because Hemingway is more widely read today. British colonial author Rudyard Kipling, the "darling" of literary collectors in the 1920s, fell out of favour for many years, but now copies of his work are rising in price again. In 2003, a first edition of Jane Austen's 'Pride and Prejudice' sold for £40,000. But, last year a rare first edition of ‘Emma’ sold for a record £180,000. The three-volume edition was originally estimated at around £70,000 but the book was one of 12 copies that was sent to Austen’s friends and family, so it gave it additional appeal to collectors. Sherlock Holmes memorabilia is also very popular. The original manuscript of 'The Sign of Four' sold for $470,000 (£243,000) back in 1996. In May 2004 a long lost collection of Conan Doyle's notebooks, sketches and correspondence was sold by Christie's in London for nearly £1 million. Atlases have become very collectable. The values of some atlases have soared far higher than in some other areas of book collecting. That could be partly due to the fact that people relate to maps on a personal level. They often collect maps of the area where they live. It has been noted that the rare book market has seen a general trend toward the visual, with photography and books of illustration also growing in popularity. Published in September 1937, this first edition first printing is in its original dust-jacket. Only 1,500 copies of the first edition were printed, and they were sold out by mid-December. Purchased by a buyer in Arizona from a New York bookseller. Published in 1644, this pamphlet by the author of the epic poem Paradise Lost defended the freedom of the Press as the British government suppressed their opponents’ publications. Purchased by a UK buyer from an American bookseller. Thomas More became a Catholic martyr when Henry VIII beheaded him. This 1518 fourth edition outlines his ideal state, and pleads for religious tolerance and universal education. Purchased by a UK buyer from an American bookseller. Little written by Donne appeared in print in his lifetime but hundreds of manuscript copies were circulated by hand. This 1633 first edition was the first collection of his poems. Purchased by a buyer in Pakistan from an American bookseller. Ian Fleming's James Bond titles are always very collectable and many now command big price tags at auction. First editions with the original dust jackets are particularly valuable. Casino Royale from 1953, First Impression, First Issue, in "Fine" condition and with its dust jacket, decorated with heart motifs recently fetched $60,000 at auction! This handwritten version of the Koran was published in the Arabic year of 1152 (1731 in the Western world). Purchased by a buyer in Pakistan from a bookseller in Germany. In 1847, Congress asked Schoolcraft to document the history, condition and future of the aboriginal inhabitants of the US. It is one of the most important works about the American Indian. Purchased by a buyer in California from a bookseller in Philadelphia. The 1997 first edition of Rowling's debut book are hard to find. There was a hardcover print run of just 500; most copies are now owned by collectors. One in mint condition and unread, was recently purchased by a buyer in California for $36,000! But, even paperback editions of Harry Potter books can be valuable - A copy of Harry Potter and the Prisoner of Azkaban, paperback edition, signed by Daniel Radcliffe and Emma Watson, will be worth around £700 ($1,000) now. A very rare medical handbook, it was published in 1786 in Paris and bound in full leather. Purchased by a buyer in Pennsylvania from a bookseller in Germany. Orwell was hospitalized with Tuberculosis just after the book's publication. He did not recover, so signed copies are scarce. Some were given to hospital staff – this edition was inscribed "For Elly with regards, Geo. Orwell." Purchased by a UK buyer from an American bookseller. Follow your heart when collecting books. If collecting books was just about buying low, selling high, and making money, then there are probably other commodities that will make you more money, more quickly. There are other kinds of wealth than just money, and one kind is the satisfaction of having a bookshelf full of beautiful copies of books that have particular value to you—be they cultural milestones or just books that you loved reading and which helped shape the path you took in life. This is a very real kind of wealth, and is one that every book collector has the opportunity to benefit from, by choosing books that are inherently meaningful and valuable to you. It may be worth checking your bookshelves and the car boot sales for rare editions that could make you a fortune! Good places to start searching for books that interest you are: www.abebooks.com and www.alibris.com Both sites have thousands of books for sale, allowing you to hunt for the particular type of book that most interests you. Of course theres always www.ebay.com too.